Research and development from multinational firms in the U.S. is shifting overseas to countries like India, China and Israel, spurred by the growing demand for software, according to analysis from researchers at Carnegie Mellon University and Georgetown University. Traditionally, R&D for U.S. multinationals was largely domestic. If it shifted overseas, it was "concentrated in developed, industrialized nations," such as Germany, France, the U.K., Canada and Japan. IT and software functionalities are driving innovation across technical domains, according to the research. This places stress on access to engineers available to contribute to new products and services. As a result, multinational firms moved R&D overseas, driven by short supply rather than seeking to "tap superior foreign knowledge." Software is becoming a dominant industry and organizations not making investments are more frequently left behind, according to the report. Much of the industry, however, has rapidly turned toward software invention and investment, as shown by the increase in software patents. 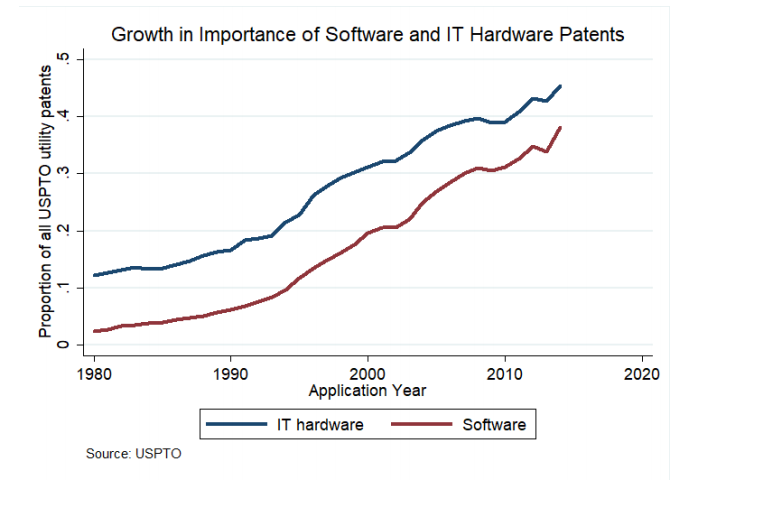 In 1990, software accounted for just 5% of patents filed to the United States Patent and Trademark Office. In 2015, that number reached 40%. One of the contributing factors to the shift is companies are no longer reliant on one firm, such as IBM, to create all the components of a computer. Instead, standardized parts allow for hardware and software development to spread out across companies. While the talent wars rage in the U.S., more firms are looking overseas for talent, growing new development hubs along the way. Domestic demand is also driving firms to bring in foreign talent, made possible by programs like the H-1B program. And foreign talent is taking on a larger share of the market of IT workers. In 1993, they accounted for 16% of the IT workforce; in 2010, the number increased to 32%, according to the research. The immigration market is much more restrictive than it was in the 1990s, which preliminary evidence shows does have an impact on the shift of R&D overseas, said Britta Glennon, a PhD candidate at the Heinz College of Information Systems and Public Policy at Carnegie Mellon University, in an interview with CIO Dive. The move overseas isn't necessarily a result of changing immigration policies in the U.S., particularly in the "Buy American, Hire American" era. Companies are not arbitrarily choosing sites for overseas R&D development. The "knowledge assets" of the host country drives foreign investment in R&D, with focus on a steady supply of high-skilled workers. Unique talents are particularly alluring for investment, according to the researchers. The shift also reflects an overall market change. In the past, manufacturing used to be offshored; now it's R&D, said Glennon. All this comes as a response to a rapid technical shift.